–former shelter resident whose family received a delivery from our Simple Household Needs volunteers. 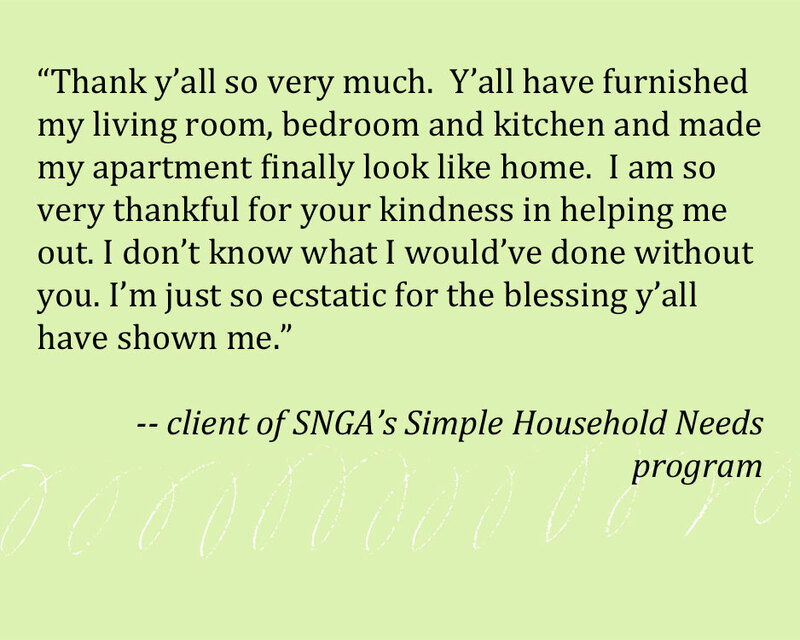 –Client who received furniture and household items from SNGA’s Simple Household Needs. “They are the sweetest group of people I have met yet. They helped me and my children big time! 5 stars!”—Simple Needs GA client. While Wendy and her family were homeless, the owner of a storage facility had auctioned off nearly everything they owned. It was just the beginning of a long-term relationship between SNGA and Wendy’s family. Over the years, Wendy’s children, who range in age from six to 18 years old (one child has autism and severe ADHD), have been thrilled to receive brand-new birthday and Christmas presents with the help of SNGA’s donors and volunteers. “They have brought smiles to my kids’ faces many times,” Wendy said. 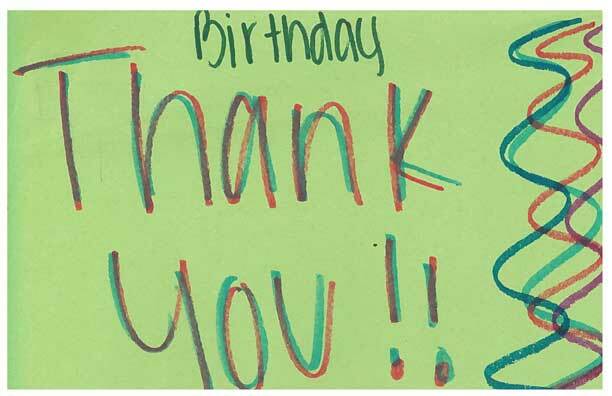 Our My Birthday Matters program focuses on homeless children whose parents just aren’t able to afford to buy them birthday presents or otherwise celebrate their special days in the way that most of us are accustomed to. This can be a heart-wrenching situation for both the kids and their parents, who are already facing very difficult circumstances. Families are often deeply grateful when we show up with things like brand-new toys, school supplies, a no-sew blanket, a stuffed animal, reading books, coloring books, underwear, socks, and other useful items. Just to give you a sense of what this program can mean for families, here’s the story of a family we helped. This family was considered homeless by the school system because the mom and her three sons were living in an extended-stay hotel off of Delk Road. Social workers told us about the upcoming 11th birthday of one of the boys. The family recently moved into a rental house but cannot yet afford furniture or even beds. When we told the mom about our Simple Household Needs program, which supplies families with furniture, beds and other household items, she burst into tears. “We have been on the floor since the 12th when we moved here, and I could not afford air mattresses or anything,” she said. But then we had to give her the bad news: The need in our community is so great that we have a long list of families waiting to receive household items from us; it would be possibly six or eight weeks before we could provide any furniture or beds to the mom and her sons. As we explained to her, Simple Needs GA doesn’t own a truck, and relies on just a few incredibly dedicated volunteers to pick up and deliver household items to families using rental vehicles. It’s expensive and time-consuming to do this, and so we can’t possibly help everyone we want to help, which is tough for us. 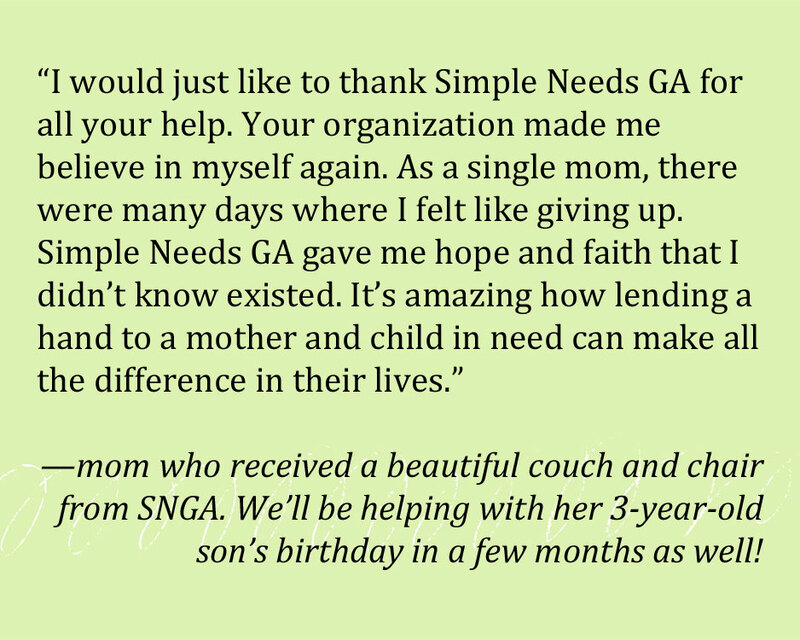 As a smaller, community-based nonprofit, Simple Needs GA could never be a “one-stop shop” for all of its clients’ needs. And yet, when your friends and neighbors come together to serve a common goal, amazing things can happen. Take the family of five that recently contacted us for help. Dad eventually found work, and the family was able to move into an apartment, but its large rooms were starkly empty. In late March, our tireless volunteers brought her a king-sized mattress and box springs, two full mattresses and box springs, and a table and chairs. The boys were so excited to have beds so they didn’t have to sleep on the floor any longer. A single mom with a young daughter and a teenage son went to a local church and asked for some pots and pans so she could cook for her children. 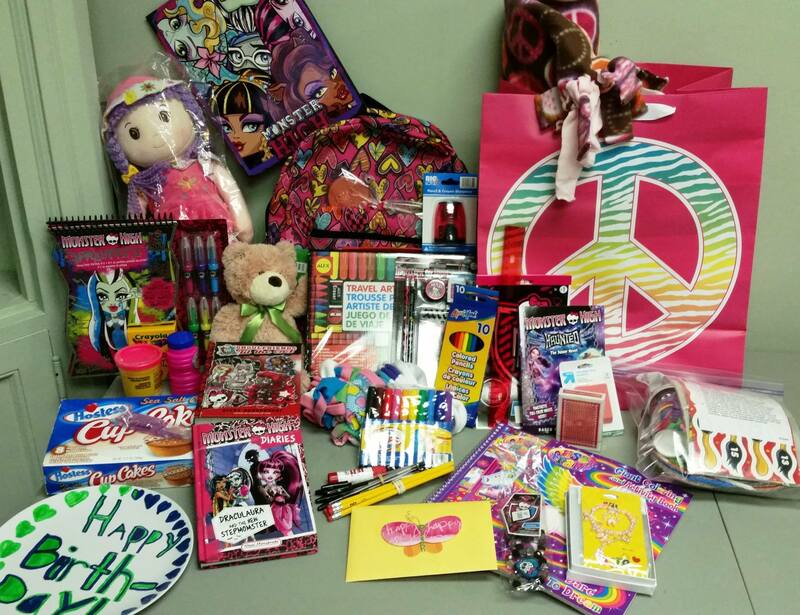 The church referred this family, which had been staying in a homeless shelter to escape an abuser, to Simple Needs GA. They were overjoyed at having successfully rented a house in their newly adopted state of Georgia, but were nonetheless sleeping on one mattress loaned to them by their landlord. Over and over again, Brenda and regular SNGA volunteers have watched clients visit the warehouse and cry after realizing that they will be taking home things like linens, towels, pillows, silverware, pots and pans, small appliances, lamps, books, underwear, toiletries, TVs, microwaves and even gaming systems.